Background Emergency medicine (EM) pharmacists are increasingly recognized as integral team members in the care of emergency department (ED) patients but there is variability in the scope of direct patient care services. Objectives The primary objective was to categorize direct patient care activities and drug therapy recommendations. The secondary objectives were to categorize recommendations based on drug class and to determine the proportion of recommendations associated with Institute for Safe Medication Practices (ISMP) high-alert medications. Methods This retrospective, single-center, chart review was conducted in an academic ED with 65,000 annual visits. EM pharmacists documented direct patient care activities in the electronic health record. Documented activities from 1/1/2015 through 3/31/2015 were abstracted electronically for analysis by a trained reviewer. Results There were 3567 interventions and direct patient care activities documented. The most common activities were facilitation of medication histories (n = 1300) and drug therapy recommendations (n = 1165). Of 1165 drug therapy recommendations, 986 were linked to a drug class such as antimicrobial agents (31.9%), cardiovascular agents (16.6%), and analgesic agents (13.2%) and 20% of these interventions were associated with ISMP high-alert medications. Conclusion EM pharmacists documented several types of direct patient care activities with the majority being drug therapy recommendations and medication histories. Presented at the American College of Emergency Physicians (ACEP) 2015 Scientific Assembly in Boston, MA, October 26th–29th, 2015. No funding was received for performing this research. Clinical Pharmacist Services in the Emergency Department//ACEP. American College of Emergency Physicians Policy Statement. 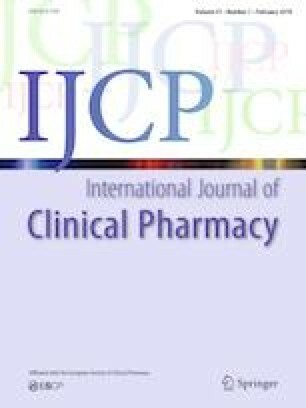 https://www.acep.org/clinical—practice-management/clinical-pharmacist-services-in-the-emergency-department/. Published 2015. Accessed January 18, 2018. Institute for Safe Medication Practices (ISMP) Institutional High-Alert Medications. Institute for Safe Medication Practices (ISMP). https://www.ismp.org/sites/default/files/attachments/2018-08/highAlert2018-Acute-Final.pdf. Published 2018. Accessed October 29, 2018.